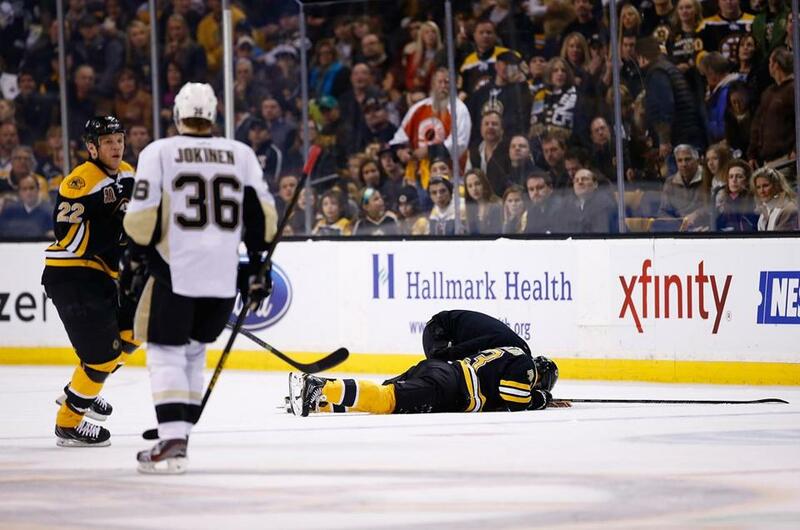 Brad Marchand lay on the ice after getting kneed in the head during a Dec. 7 game against the Penguins. The NHL rule book, referees Brad Meier and Gord Dwyer, and the Department of Player Safety came to the same conclusion. Brooks Orpik did not do anything wrong when, on the first shift of the Bruins-Penguins game Dec. 7, the former Boston College defenseman flattened Loui Eriksson. Orpik’s wallop may not have violated any rule, whether it be interference, charging, or hit to the head. But it flunked the eye test so poorly that even the “E” was blurry. Orpik is not at fault for the outcome that left him reeling with a concussion, memory loss, and neck pain. Shawn Thornton has no excuse for the attack that put Orpik on a stretcher and his own unblemished standing in disrepair. Thornton played 521 career NHL games the right way. Thornton’s 522d game threatens to blight all the goodwill he banked before then. No player deserves to be on the wrong end of such a one-sided assault. But if Orpik’s hit was clean, it was also vicious and disrespectful. Eriksson never saw the 6-foot-2-inch, 219-pound Orpik approaching. Eriksson didn’t have a chance to brace himself for the collision. Eriksson is feeling better but is recovering slowly. After the game, Dan Bylsma classified it as a “good hockey hit.” The Pittsburgh coach would not have spoken those words had Zdeno Chara cleaned Sidney Crosby’s clock in a similar manner. Sidney Crosby has accomplished a lot by age 26, winning a Hart Trophy and the Stanley Cup among other things. He appeared in his 500th game earlier this month, and three points in that game gave him 706 for his career. Orpik isn’t alone in dishing out such thumps. The most memorable one within the year took place in the opening round of the 2013 playoffs. Yes, Eric Gryba connected with a shoulder hit on Lars Eller. Yes, Raphael Diaz threw an up-the-gut suicide pass to Eller. Yes, Gryba caused Eller to lose the puck. Yes, it was the playoffs, when checks are expected to be thrown even harder. But Gryba, the former Boston University defenseman, connected with a zero-respect check. The aftermath: concussion, broken nose, gone for the playoffs. A puddle of Eller’s blood stained the Bell Centre ice as red as Montreal’s home jersey. Two games later, the lid blew off in a 6-1 Ottawa win. Just about everybody fought. The teams combined for 236 penalty minutes. It would not have surprised anyone had Michel Therrien and Paul MacLean tossed aside their suit jackets and threw down between their respective press conferences. Did Gryba need to throw that hit? No, no, no, no. These hits are common. The Bruins, like every team, are guilty of throwing them. Last month, Johnny Boychuk pancaked Erik Cole. The Stars didn’t like it, as evidenced by Vern Fiddler’s challenge. Boychuk and Fiddler were called for roughing. Boychuk was not penalized for his hit on Cole. Two seasons ago, Boychuk was on the wrong end of the type of check he usually delivers. Chris Neil obliterated an unsuspecting Boychuk with a shoulder-to-torso wipeout. Neil was not penalized either. The Bruins were involved in the ultimate no-respect incident: Matt Cooke’s blindside strike on Marc Savard. Just three years ago, it was a hit that merited neither penalty nor supplemental discipline. It helped to end Savard’s career. Ask any player: Would you want your teammate to be hit that way? The answer, every time, is no, no, no, no. Yet they continue to throw them. There is a culture, fueled by coaches and general managers and players themselves, that places respect for a fellow employee far behind lighting up an opponent in the quest for a permanent home on YouTube. In that context, a fight is far more fair, honest, and courageous. Roughly five minutes after Orpik’s hit on Eriksson, Thornton did the right thing. Thornton jabbed Orpik several times to prompt him to fight. Orpik declined, as was his right. Orpik, according to www.hockeyfights.com, has 10 career scraps. Thornton doubled that number in 2011-12 alone. The Penguins got a power play out of Thornton’s roughing penalty and scored soon after. Amid the night’s misguided events — Orpik’s hit on Eriksson, James Neal’s knee to Brad Marchand’s head, Thornton’s assault — the most honorable interaction was a fight. A split-second after eating each other’s fists, Milan Lucic and Deryk Engelland parted swiftly and retreated to their respective boxes. That absence of emotion was once one of Thornton’s calling cards. In literal fight-or-flight situations, Thornton approached his handiwork as coolly as Tuukka Rask stops a puck. In two fights to answer for wrongs on Savard — Steve Begin’s crack in the back in 2008, Cooke’s elbow to the head in 2010 — Thornton dispatched both opponents in later games. This time, Thornton was angry. Thornton’s loss of control exploded into the biggest mistake of his career. Even worse than the 15 games and $84,615.45 in salary he forfeits is the wreckage of the reputation Thornton battled to sustain. Hockey is not safe. It is a game of contact and conflict. Players wear two knives, skate on hard ice, wear bone-breaking equipment, and carry sticks that can be used as weapons. Injuries are guaranteed. Their degrees of severity would decrease if players practiced real respect instead of preaching it. The Jets had big plans for 2013-14. Before the season, general manager Kevin Cheveldayoff committed $93.1 million to restricted free agents Blake Wheeler, Bryan Little, and Zach Bogosian. Winnipeg gave Mark Scheifele and Jacob Trouba varsity status. For all that, it looks like the third straight playoff no-show in Winnipeg since the franchise’s relocation from Atlanta in 2011. Cheveldayoff has been reluctant to replace coach Claude Noel. A very good goalie, not just an average one like Ondrej Pavelec, would make Noel appear far smarter. But Cheveldayoff might be forced to make a change. Winnipeg has enough skill to qualify for the playoffs. The issue is whether the Jets could find a better coach midseason. Winnipeg is not an easy place to sell to players and coaches. Peter Laviolette, the most prominent of the season’s three dismissed coaches, might anticipate a better opportunity. What might be easier is acquiring future assets. Ex-Bruin Mark Stuart will be an unrestricted free agent at season’s end. The Jets are already committed to Bogosian, Trouba, Tobias Enstrom, Dustin Byfuglien, and Grant Clitsome. Stuart is an alternate captain but is not in Winnipeg’s long-term plans. Stuart could help a contender such as Los Angeles or Anaheim with his toughness and experience. Stuart would net at least a prospect or a pick. Winnipeg’s bigger issue — and one that could draw a bigger return — is the future of Evander Kane. The fourth overall pick from 2009 has yet to peak. Kane is fast, tough, and skilled. But those with knowledge of the dressing room’s dynamics consider Kane immature. The Jets must determine whether Kane will grow or remain an unfulfilled talent. If it’s the latter, Winnipeg’s mission is to acquire appropriate value. The Bruins made that conclusion with Tyler Seguin. The Jets may do the same with Kane. That Brian Burke, Calgary’s first-year president of hockey operations, showed GM Jay Feaster the door Thursday was no surprise. Feaster’s track record did little to merit an extended stewardship at Calgary’s transaction desk. Consider the would-be Jarome Iginla trade to Boston. It was a wreck from the start. Feaster should have identified Iginla as a tradeable asset far sooner than March 28. Trading Iginla two years earlier would have accelerated the rebuild and brought back better assets. But it got worse. Feaster yanked the trade off the table after agreeing to acquire Matt Bartkowski, Alexander Khokhlachev, and a 2013 first-rounder. Regardless of how Iginla nixed the deal, Feaster should have insisted on executing the trade, or never agreed to it at all. Feaster then did a disservice to his franchise by accepting an inferior package from Pittsburgh: Ben Hanowski, Kenny Agostino, and a first-round pick. Hanowski is a Yale senior. Agostino is in Abbotsford, Calgary’s AHL affiliate. Bartkowski would have been a regular if not top-four Calgary defenseman. There were other questionable moves. The Flames traded a top-pairing defenseman in Jay Bouwmeester for a first-round pick, an average goalie in Reto Berra, and an AHL forward in Mark Cundari. They signed Ryan O’Reilly to an offer sheet and could have lost the Colorado forward on waivers had the Avalanche not matched. They didn’t get anything for Miikka Kiprusoff, who retired with a year left on his deal. The final product: a no-traction team missing the beef Burke believes is required to compete for a Cup. Burke pledged to be the interim GM. The full-time man will not have autonomy to implement his own vision. Burke will hire a GM who shares his vision. Former coworkers Dave Poulin, Claude Loiselle, and David McNab have similar beliefs. Or Burke will bring in someone of prominence — ex-Flame Joe Nieuwendyk would fit this category — who will execute his boss’s blueprint. The Flames’ only transaction this season was trading Tim Jackman to Anaheim for a 2014 sixth-round pick. The activity will intensify, perhaps even before Feaster’s replacement is determined. The Flames will be swift in moving UFAs-to-be Mike Cammalleri, Lee Stempniak, and Matt Stajan. Burke promised Bob Hartley and his assistants they will remain through the season. The new GM, however, should have the freedom to hire coaches if that is his wish. This will not be a simple rebuild. The NHL’s power is in the West: Anaheim, Chicago, Los Angeles, St. Louis, San Jose. The Flames will have cap space, but successful franchises build via trades and drafts. The latter two require assets and patience. Burke does not have much of either. Jay Feaster’s exit could force Buffalo to accelerate its search for GM Darcy Regier’s replacement. The Sabres have been identifying and interviewing candidates, including Boston assistant GM Jim Benning, since firing Regier Nov. 13. Overlap between the two organizations could include Nashville assistant GM Paul Fenton, Pittsburgh assistant GM Jason Botterill, and Los Angeles director of amateur scouting Michael Futa. The Sabres have the headstart, but also the more timely issue: whether to trade or re-sign Ryan Miller. Henrik Lundqvist’s seven-year, $59.5 million extension helps to frame the market for Miller, who will be a UFA after this season. Miller is two years older than Lundqvist, but having the better season. Buffalo’s next GM deserves to make that decision. Former Bruin Matt Hunwick, parked in the AHL for most of the first two months, will most likely be in Lake Erie until the trade deadline. Last season, Hunwick had the second-most ice time per game (21:31) on the Avalanche after Tyson Barrie (21:34). But rookie coach Patrick Roy has not considered Hunwick worthy of NHL duty. Hunwick has played in only one game for Colorado. Ex-Senator Andre Benoit, signed as an unrestricted free agent, has been Hunwick’s primary replacement. The primary reason Hunwick wasn’t claimed on waivers is his salary. Hunwick is in the last season of a two-year, $3.2 million contract. With so many teams near the ceiling, Colorado will have to wait until the deadline before a club is willing to assume Hunwick’s remaining salary via trade. Hunwick would be an inexpensive pickup — the asking price would be a middle-round pick — for a team seeking defensive depth. Rangers captain Ryan Callahan could be out for more than a month after spraining his left knee on Tuesday against Nashville. That’s a wicked lick for the flickering Rangers, who are fighting with Ottawa, Philadelphia, Columbus, and New Jersey to climb back into the East’s top eight. Callahan (7-6—13 in 24 games) had been skating with Brad Richards and Brian Boyle before his injury. Callahan will still be sidelined when Team USA announces its Olympic roster on Jan. 1. Callahan, who once projected to be in the Yanks’ leadership group along with Zach Parise and David Backes, won’t have much time to find his pre-Olympic rhythm. Growing revenue increases the likelihood of NHL expansion. Part of the impetus behind a 32-team league is to correct the imbalance between the conferences. It’s asinine, to say nothing of unfair, that eight clubs in the East won’t qualify for the playoffs compared with six in the West. Seattle would be the top landing spot in the West. People familiar with Portland believe that it could also sustain an NHL franchise. Paul Allen owns the Moda Center and the Trail Blazers, the facility’s current primary tenant . . . Brooks Orpik was replaced on the Penguins’ active roster by fellow ex-Eagle Brian Dumoulin. There is a rich pipeline from Chestnut Hill to the organization. Other former Eagles include Rob Scuderi, Chuck Kobasew, Brian Gibbons, and Philip Samuelsson. BC and Pittsburgh share similarities in speed and skill. Jay Heinbuck, Pittsburgh’s co-director of amateur scouting, has NCAA roots as a Northeastern alum and a St. Lawrence assistant coach . . . Like most coaches, Claude Julien usually refrains from disclosing injuries after a game. But Julien noted without prompting after the Pittsburgh game that Eriksson was diagnosed with a concussion and that Chris Kelly was hurt by a slash. In the following days, it was vagueness as usual regarding injuries to Dougie Hamilton (lower body) and Daniel Paille (upper body). Influencing potential discipline should not factor into injury disclosure . . . The Predators are pleased with the development of Jimmy Vesey. The North Reading native has eight goals and three assists through 13 games for Harvard. Nashville is putting no heat on Vesey to leave Harvard early. The player who always comes up in such cases is Louis Leblanc, Montreal’s first-round pick in 2009. Leblanc left Harvard after his freshman season. Three years later, Leblanc has yet to firm up his AHL career to earn a full-time spot in Montreal. Fluto Shinzawa can be reached at fluto.shinzawa@globe.com. Follow him on Twitter @GlobeFluto. Material from interviews, wire services, other beat writers, and league and team sources was used in this report.